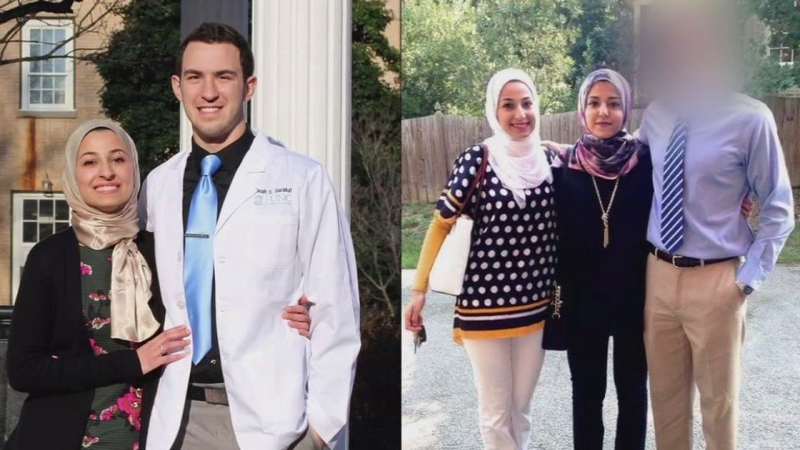 RALEIGH (WTVD) -- It's been seven months since three young people were gunned down in a Chapel Hill condominium complex, but they are not forgotten. "There are tears almost every night but there are also moments of joy and celebration of their values," said Dr. Mohammad Abu-Salha. Dr. Abu-Salha lost his daughters Yusor and Razan in the attack along with Yusor's husband Deah Barakat. Craig Stephen Hicks is charged with three counts of first-degree murder in the case that investigators say escalated out of a long-running dispute over parking. "Every day is a tough time, every day is sad," said Dr. Abu-Salha. The murders sent shockwaves through the world but they also shed light on what the three loved and inspired others to live their lives in service just like they did. One social media and in other places, the trio are referred to as "Our Three Winners." Deah Barakat was enrolled at the UNC School of Dentistry and was raising money for dental supplies for Syrian refugees. His new bride Yusor and her sister Razan were also heavily involved in Habitat for Humanity. Deah Barakat's brother Farris Barakat who helped create the Interfaith Build at Habitat for Humanity Wake County. It's a group that brings together people of all faiths to work together to build homes. Shortly after the murders he worked with the Interfaith Build to build a home in their name. "A house is symbol of fortitude of long lasting of an investment and to see an investment in their name," said Farris. Tuesday evening, a home in the 700 block of Grove Creek Lane in Raleigh was dedicated in the name of Our Three Winners and to the brand new homeowner Petrina McCoy. "The fact that it is honoring Our Three Winners makes it that much more special to me to keep their legacy alive," said McCoy. The Our Three Winners name now inspires others to continue in the service that has become their legacy. That legacy is something their families can hold on to through the loss. "It's like every once in a while we get this breath of fresh air," said Farris. Habitat Wake is also honoring the three students by supporting the construction of a house in partnership with Habitat Jordan, in the Abu-Salha Family's native country of Jordan.